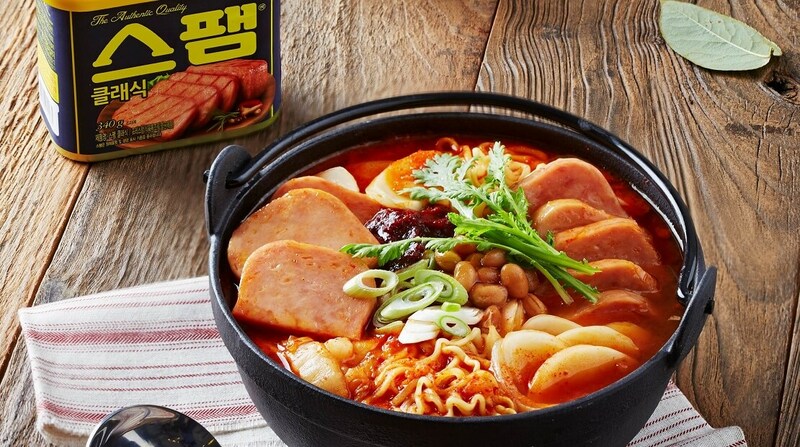 Spam, a well-known brand of canned cooked meat and a popular South Korean holiday gift, has attained 4 trillion won ($3.54 billion) in cumulative sales since its launch 32 years ago. CJ CheilJedang said Wednesday that it had sold around 1.2 billion 200-gram cans of Spam in the product’s history — the equivalent of 24 cans for each person in Korea. Spam was introduced to Korea by the US army during the Korean War, and domestic production started in 1987. CJ CheilJedang manufactures the brand with technical cooperation from the US company Hormel. In Korea, Spam is a side dish that is especially popular as a gift during the Lunar New Year and Chuseok holidays. In 2006, 20 years after the product’s launch in Korea, annual sales hit the 100 billion won mark. Its popularity continued to soar, with annual sales reaching 300 billion won in 2016. As of 2017, Spam’s market share reached 50 percent. Last year’s annual sale figure of 400 billion won created a 300 percent sales gap with its closest competitors in the industry. CJ attributes the food’s popularity to its status as the holiday gift of choice since the 2000s. Spam gift sets account for 60 percent of annual sales, the company said.